The start/finish is at Weisel Hostel. There is a parking lot at the hostel, halfway between the house and the road on the right. Don't park in the few spots right next to the house -- these are reserved for the house parents and event personnel. Your RBA and volunteer Len Z. will be there Friday night for the start. As usual, breakfast items, including hot oatmeal will be available one hour before the start. Volunteer Norman S. will be greeting you at the finish. Some of you may also see Len Z. along the course at a secret/revitalement controle during the event. If roughing it with the dormitory-style hostel accommodations is not for you, there are several chain hotels in the Quakertown area. While 90% of the roads are in good enough shape, 9% are in pretty rough condition, and the remaining 1% are in appalling shape. After two pretty rough winters in a row, the untreated cracks from last year have now become gaping potholes and craters this year -- if you hit one of these at speed, it will most certainly ruin your day. Unfortunately, this is especially true for just about all the roads in Bucks County, where you will be riding in the dark at the start and finish. Some of the bigger hazards have been highlighted on the cuesheet, but you should be on the look-out for potholes at all times, and keep a safe distance while riding in a group so you can safely maneuver around these hazards. -Mile 1.6: As noted on the cuesheet, the first couple of miles of Ridge Rd are very rough. Please keep a safe follow distance if you are in a big group, so you can pick your way around the potholes. -Mile 23.0: You'll be passing by the Milford bakery which usually is open before the official 6AM opening time. -Controle 3 is officially the Village Farmer and Bakery, but you may use any store in Water Gap to get your card signed. -Mile 100.3: there is a diner in Bowmanstown which is the last opportunity to replenish your supplies for the long 49 mile segment between Controles 3 & 4. -Mile 151.2: there is minimart to replenish your supplies for the long 51 mile segment between controles 4 & 5. -Controle 5 in Jonestown is the same one used in previous editions but it has changed ownership from Hess to Speedway. -Controle 6 has a diner that can be used instead of the mini mart. However, it no longer is open 24 hours, and will be closing at 11PM. But the Minimart has a "Drivers Lounge" on the 2nd floor with chairs and a couch if you would like to take a long rest. - One of the most dangerous thing you will encounter on the road just might be another cyclist. Keep a safe following distance when riding with other cyclists you are not familiar with. Please avoid forming a large bunch at the start of the ride. - Plan on replenishing supplies at the controles stops. The controles are typically at a store or restaurant. Finished the 2015 Crush the Commonwealth with Brett from Philly in 30:40 Saturday morning at the Liberty Bell. Norman S welcomed us and we snapped photo at the Bell with my PA Rando jersey on - first time I took my long-sleeve jersey off in the 30-miles of chilly/cold riding! Conditions were great this year with the GAP trail dry and as hard as it can be, and with tailwinds from Rockwood to Somerset and all the way to York. Couple randonneurs represented with Erica from NJ finishing strongly despite her first time and "flying blind" having left her Garmin and other supplies at the bus station. Tom Oswald's sub-30 hour time from 2 years ago was not threatened and truly remarkable considering I had help from Paul and Brett all the way from Breezewood whereas Tom rode alone. Got very cold Saturday night and every piece of clothing and fresh set of hand and foot warmer pads applied in York. Paul too cold and drowsy to continue so felt bad leaving him on the floor at the York Sheetz at 3 am. After last stop at Morgantown Burger King where Brett remarkably consumed 3 breakfast sandwiches, Brett and I decided not to try to hammer and break 30 hours. Rode the Route 23 rollers, the annoyingly overpriced-SUV-congested Phoenixville streets, and the equally triathlete-congested Schuylkill Trail at a leisurely pace of 14 mph or so and chatted about bike's and road race training. Brett is a Cat 1 racer who has ridden kermesses in Belgium. Despite his 6'-5" height he has the most aero bike position I have seen - as flat a back as Zabriskie or Julich. Something to do with the no-rise stem and likely 12" drop from saddles to bar! It seems every racer in Philly know Brett because I heard at least 7-8 passing bikers greeted him on our way in from Manayunk. About 40 bikes with lights blinking in the dark at The Point fountain at 5 am Friday morning. We were escorted to the GAP through 15 miles of bike trails to McKeesport by Pgh bike enthusiasts (about 35 CTC starters I think?). "RAAM guy" Jason started very fast and broke away on his aero bike as soon as we hit the GAP after the neutral roll-out. By mile 40 I was riding with large group of 15 or so including some teammates from Baltimore Bike Club and some other very determined racer-looking guys weighing 140-160 pounds. Pretty intimidating compared to the normal turnout. We passed Jason at about mile 50 - he was having technical issues with tri-bottle holder and the GAP knocking his bottles off. He also had a flat (tubeless) and replaced rear 25mm tire with a 23mm which couldn't have helped on the GAP. We could manage 15 mph and not a bit faster for 106 trail miles! At Ohiopyle at mile 65, 5 hours in, we made our first stop. I grabbed a bottle and a banana bread loaf and hit the trail in first place after a 10-minute stop. The BBC team and others sat down for breakfast - I never saw them again. After a nature break at mile 80 I was joined by group of 4 including Jason and Erica. Despite dry conditions the last 20 miles to the end of the GAP at Rockwood sucked as usual and my fat tires (650b x 42 at 45 psi) were the secret weapon as I found myself alone and 5 minutes ahead of Jason, Erica, and 2 Pgh mountain bike guys. After bathroom break, switching shoes, and lubing chain at end of trail (7 hours in, mile 106) I rode hill out of Rockwood with Jason with a nice tailwind. I was feeling good but Jason had suffered on trail with skinny tires and lagged behind me and I did not see him at Somerset where I stopped for about 40 minutes at mile 116. At Somerset Sheetz, Brett and Paul from Ohio rolled in and I rode with them for 20 miles trying to catch Erica and the 2 mtnbike guys before I flatted (rear small piece of glass - 9 minute diagnosis/tube change). I rode 30 miles alone to Bedford with glorious tailwind and then caught up with Erica and noticed the Pgh mtnbike guys just rolling out of a convenience store. Erica stopped at Bedford Subway and so 3 of us rode to Breezewood. Turns out we leapfrogged Brett/Paul and Jason at Bedford and 3 of us arrived at Breezewood (mile 177) in first place. After Brett/Paul/Erica arrived the 5 of us (Erica stayed) left Breezewood about 10 minutes after seeing Jason ride by the Sheetz - we never saw him again after that and assumed he was going to ride to first finish as he had told us his plan was to ride with minimal off-bike time. Five of us rode the pot-holed, grassy Abandoned Turnpike 9-mile stretch together. Creepy in the two tunnels and group of locals with flash-lights strolling the 6,300' tunnel as we rode through! 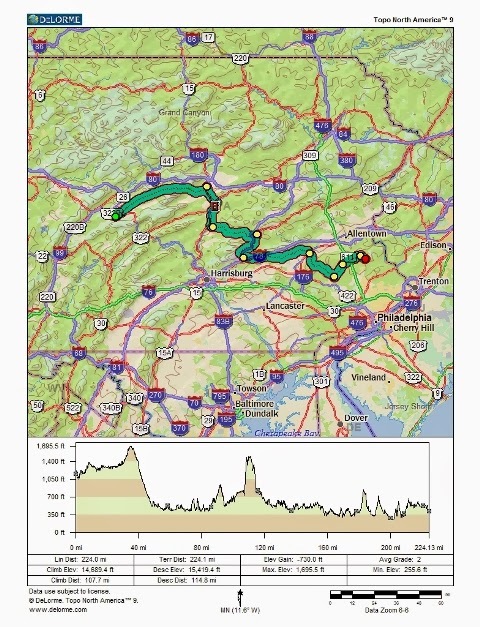 The 2 Pgh guys had a room in Chambersburg and were riding very strong so we "let them go" and Paul/Brett and I rode smoothly to Chambersburg (mile 228), after suiting up in more layers and reflective gear at top of Cowans Gap (mile 206). Cold but pretty 58-mile ride through Adams County rollers to York. At York Sheetz with about 100 miles to go we were very cold and drowsy. Paul could not go on so Brett and I rode the final stretches together. At the finish was a guy waiting for Jason - we were surprised he did not finish ahead of us because we had not seen him on our ride in. Realized we finished first and a little guilty about not pushing it more in the last 50 miles. Apparently Jason got lost and his front light failed causing him to ride slow at night. He finished about an hour after us just before Stef Burch finished - reigning champion Stef was first female finisher yet again! All in all felt pretty good but the constant rollers and out-of-saddle efforts have my knee very tender. Carrying extra set of shoes in Camelback backpack not such a good idea - neck and upper back pain required some Aleve on the ride. I rode the first 106 miles on the GAP in sandals and then put my Northwave shoes on and carried the bulky sandals for 275 miles. Did not use my small ring and got by with a 48x30 low gear for the hills around Somerset, Bedford, and to Cowans Gap. 382 miles and 15,000' elevation gain per Brett's Garmin. 25:30 hours riding time averaging 15 mph. 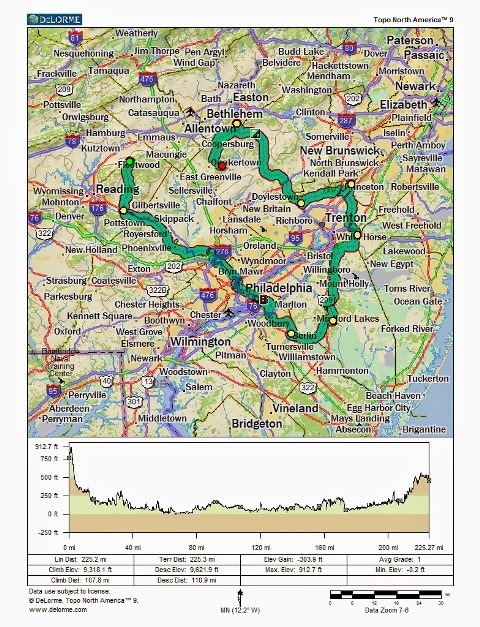 Apart from poor shoulder and busy Route 30 stretch around Chambersburg for 30 miles, the route was not bad - highly recommend riding Chambersburg to Lancaster at 1-5 am when there are no cars on the road! Lots of twigs, branches on the GAP so I am glad I removed my fenders before the ride. Consumed banana loaf, 5 chocolate bars, 2 Sheetz burritos, 2 breakfast sandwiches, quart of Ben/Jerrys, 4 choc milks, 5 Gatorades, some beef jerky/nuts, and a few coffees. Carbo loading (several course meal and dessert) and several Pgh beers the night before were probably helpful. No cramping but took several enduralytes just in case. Hoping not to ride CTC again as I have ridden both ways. Good company riding with Bob and Nick from Philly, Stef B, Erica, Paul, and others. I think riding with others and talking through the night are the key to riding straight through. Going all the way back to last November, we've had weather conditions with freezing cold, wind, snow, icy roads, and some wet thrown in as well. But in the category of "Careful of what you ask for", the +80F temperatures for the Water Gap 300/200k was almost too much heat too soon, after such a long spell of cold weather riding. 21 of the 22 300k starters made it around the course in good time. All 4 of the 200k riders made it to the finish, with one rider finishing beyond the time limit. Of note, there were a number of first time Eastern PA participants, including Alfred D., Jim R., and Joseph R. Jim also finished his very first 300k -- congratulations on that accomplishment. Jim R writes: "...Thanks again for organizing such a great 300! I am very glad that such a great and beautiful ride was my first 300, and my first ride with the PA randos..."
Joe F. writes: "...Tom: It would be hard to imagine a more perfect weather day than the one we had yesterday for the 300 Km. A tough but fair course, good company throughout the ride -- what could be better? (Well, I could do without Gallows Hill Road, but I quibble.) ;-) Thanks to Norm for seeing us off in the morning, and to you for greeting us with a smile at ride's end!.." 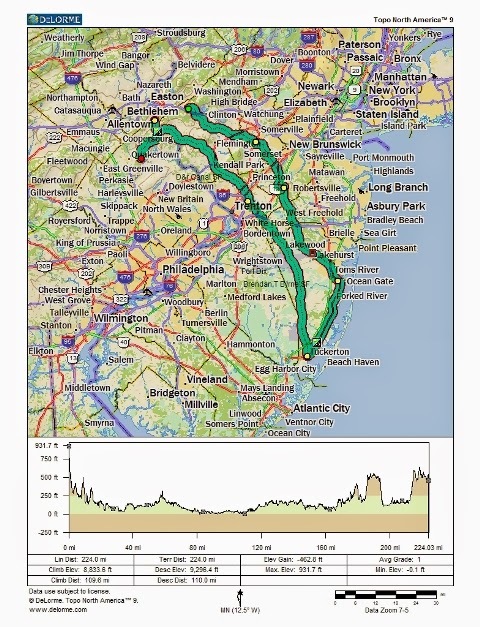 Jim H. writes: "...Although I was parched at times, the weather could not have been much better for my first PA 300k brevet. A tough and challenging course although my reunion with Old Mine Rd., which I rode on my very first brevet, was none too favorable. 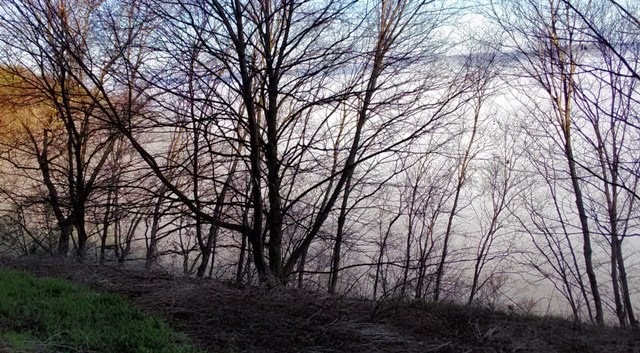 :-) A spectacular 'valley fog' view from the top of Blue Mountain as well as great river views for a significant portion of the course. And nice folks to ride with. Thanks for yet another great ride. Thanks also to Eoghan and Norm for greeting us at the start, Norm for signing us in, and to Pat and Cecilie for their course intelligence. 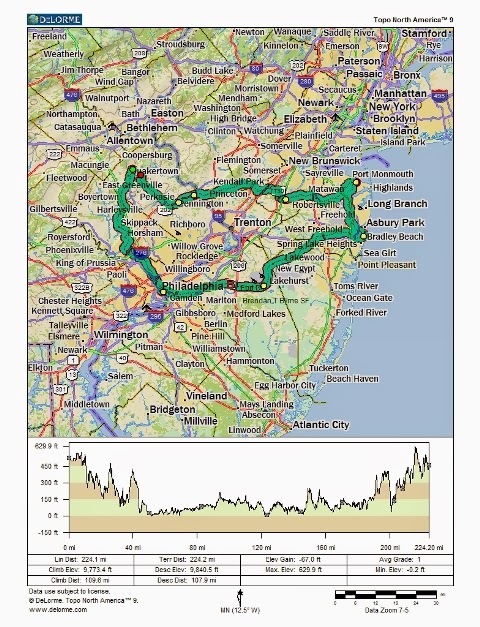 ...."
Chris E. writes: "...thanks for organizing the 300k on Saturday (along with all the other brevets), it was a beautiful route and a fun ride. . ...."
Greg K. writes: "...Thanks for another great ride. The spring weather finally showed up along with a perfect pattern of rain on Friday... sunny riding...rain on Monday. Among the many memorable moments was crossing the top of blue mountain to find the valley filled with a think fog. Thanks again. . ...."
Joe R. writes: "...Thanks again for being such good company on my first Eastern PA brevet. I was pretty sure when I started a few minutes after the main group left the hotel that it was going to be a long solitary day, but instead I had the ultimate intro to the route courtesy of the organizer himself,... That hot-dog-and-pie special is worth every bit of $2.95 plus tax...."
Larry B writes: "...I went into this ride not knowing what to expect. Physically I thought I was ready for the ride with lots of miles of training before the ride. Mentality I just wasn't there ... I think I know why Tom gave me the SPOT tracker because if anyone can get lost on a ride, it's me. Thank goodness that didn't happen since I was with riders all day who knew the course. Chris E. was the real work horse out on the course. It's been sometime since I have been around a rider that strong who just puts his head down and keeps cooking. He finished 10 minutes behind the lead group only because he took a break 10 miles from the finish line. He could have finished way ahead of everyone. You see all kind of bikes on a rando ride and I was super impressed with Tom O's custom built bike he made out of mismatched steel. Jim H. was one tough climber, next time he can use hand signals pointing up which means we climb again lol ... Thanks again to all the riders I rode with ... without them my ride wouldn't have been as easy. And thanks to all the volunteers and to those who did the pre ride. This was a great ride and a chance for me to get back the rando fever once again. ..."
Your safety is the number priority on an Eastern PA event. Please mention any safety hazard you might have spotted, or near-miss incident you saw. We value this feedback highly and it will help PA Randonneurs improve the next edition of the event. 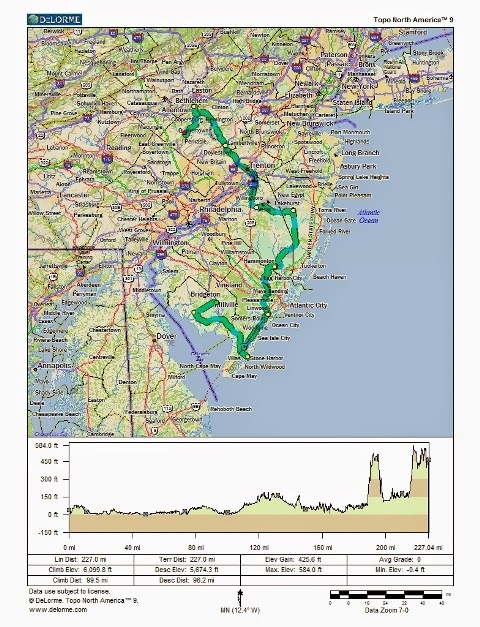 Although the preride scouting report highlighted the rough roads to watch out for, I was absolutely mortified at how bad some of the roads were in Bucks County. On my way home from the hotel finish, I looked at some of the alternate roads. But instead of having just potholes, the alternate roads had no shoulder and busy traffic in addition to potholes. Special thanks to organizer Norman S. for signing in the riders, cooking the oatmeal, and sending the riders on their way at the start. And thanks also to volunteer Eoghan B. for helping out with the bike inspection. ... use the on-line registration form by the Thursday before the event if you'd like to join the roster. Organizers Norman Smeal and Eoghan Barry will be signing you in at the Hampton Inn start and performing the bike inspection. The hotel will be putting out coffee, bagels, danish and fruit one hour before the start, and Norman will have some hot oatmeal for you as well. Your RBA will be greeting you at the finish -- if you don't see me in the lobby, I may be in the volunteer room, #108 which is right off of the lobby. If you arrive at the finish before I do, you can get your card signed at the front desk and leave it there for me. The volunteer room is available for you to take a shower, if you like. A volunteer preride was completed by Patrick and Cecili G. this past weekend. 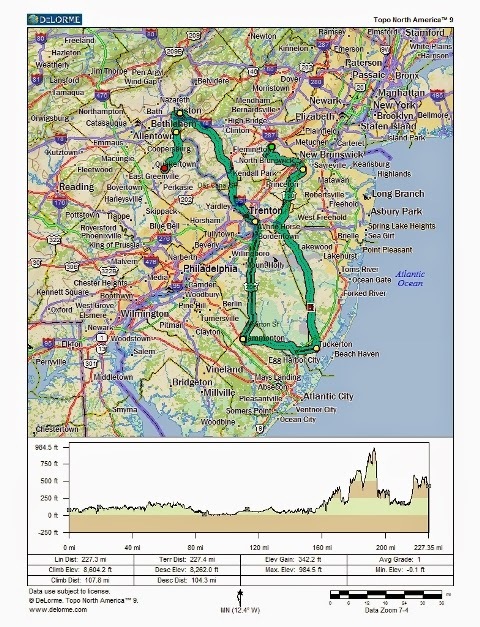 Patrick reports: "...Thanks again for another great route. It was clear and cold when we started out. Probably a little too cold, but by the time we made to the top of Blue Mountain the sun, and the climb, had warmed things up considerably. There is not too much to report on the first leg; some random debris on the shoulder of 378, but nothing you can't get around quite easily. There is still a fair amount of gravel on the shoulder up Blue Mountain Drive and Cherry Valley Rd from 191 to 611 still has some rough patches. Other then that the second leg was pretty smooth. After leaving control 3, River Road has some rough patches along the shoulder. The routing up Hollow Rd and Hidden Lake Drive was a nice change of pace to River Rd. There was certainly less traffic than River Rd, but it was not car free. There is a lot of gravel on the turn onto Community Dr. The road itself is not in bad shape, but there is a lot of debris (branches and sticks). After that it was pretty easy going all the way to Flats Deli. The next section is fine, until you reach Old Mine Rd. The road is in its usual bad shape up the climb, but no worse than years past. There are a few rough patches that riders should watch out for on the stretch to the river crossing, particularly on the one lane section just before the bridge. 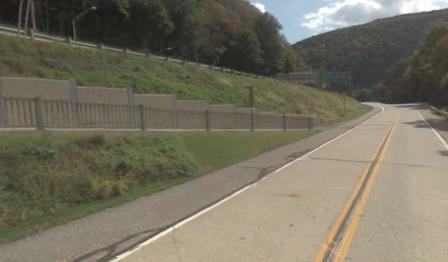 There is nothing to report from Water Gap to Belvidere. The roads there are all in pretty good shape. Heading to the final control the bear left at mile 166.6 joining Durham Rd is just before the stop sign. Gallows Hill Rd is in pretty bad shape. Being that it is a long slow uphill, you can pick your way around the potholes and what not, but it is a little rough. There is some gravel in the turn onto Maple Rd and Stoney Garden Rd is still pretty rough, as it was last year. Riders coming through after dark should be cautious. Once you hit Saw Mill Road the roads are in good shape the rest of the way. Thanks again, we really enjoyed this ride. ..."
- With the rough winter we just had and as outlined in the pre-ride report above, you should be extra vigilant for potholes and rough road surfaces. - The descent from the top of Little Gap is long and steep and it is easy to reach speeds of +50 MPH. But just because you can go that fast, doesn't mean it's a good idea. There are a couple of turns that could have loose gravel and the winds off the mountain can be unpredictable. Please don't go any faster than your guardian angel can keep up with! - There are limited services available between Little Gap and Water Gap. - There are limited services available on the Water Gap loop. If you are very tired, it may be a good idea to take a nap before a long drive home. Rooms are available at the finish hotel.